Last night, while we were both at work, Mrs. Notafoodie and I were chatting about what to have for dinner. “Should I just go downstairs and pick up some stuff?”, she asked. I knew right then that we were going to have a great dinner. Mrs. Notafoodie works above Grand Central Station and therefore would be shopping at the Grand Central Market. When I got home I was NOT disappointed. The first items that were taken out of the bag were the ingredients for our main course- Rainbow Chard and PORK CHOPS!!! You had me at “hello”! The chops were boneless (I’m usually a “bone in” type of guy but I’m not complaining), around three inches thick, and marinated in figs and balsamic vinegar. She also informed me that she got some treats. She pulled out a couple of hunks of heaven from one of my favorite NYC shops, Murray’s Cheese. The first was a “stinky blue” cheese that made my tongue numb and the second was a triple cream kind of cheese with a French name that I cant pronounce. That one was so rich and creamy that it almost tasted like eating butter. Then came a special treat. .. 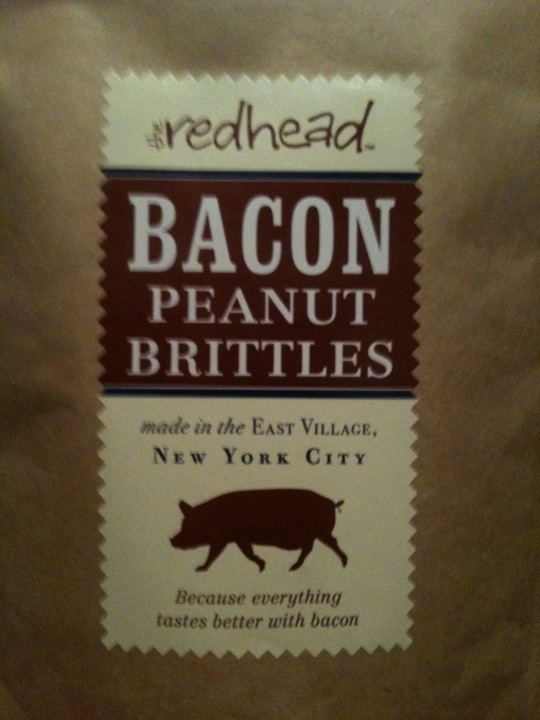 This delicious concoction of maple roasted peanuts with smoked bacon came from The Redhead. I believe the ingredients speak for themselves, so I won’t say anything except “drool”. 2. If I was outside, I’d be leaving the cheese unattended with Mrs. Notafoodie. Who knows what will be left by the time I was done? I opted to pan sear the chops in the kitchen (where the cheese and bourbon were), and finish them in the oven. The chard I cooked with a little bit of butter, oil, garlic and onion. Nothing fancy. I also finished them of with a little grated Pecorino Romano. As a good Italian, I always have this around the house. I use it as a salt substitute and put it on everything, because much like bacon, grated cheese makes everything awesome! I don’t have an “after” photo, but imagine that the plate had been picked over by a pack of vultures and then licked clean by wolves that chased the vultures away. That’s how it looked. I can’t decide if your next career is going to be as a chef or a food photographer. Everything you put on the table looks delicious. Please cook that way during the last week of December. Thanks! What amazes me is that most of my photos are just quickies taken with the iPhone.